A successful brand says many things to its audience and to tamper with that can be dangerous (remember the Consignia fiasco); get the rebrand wrong and it can at best alienate your existing audience and at worst fail to gain a new one. 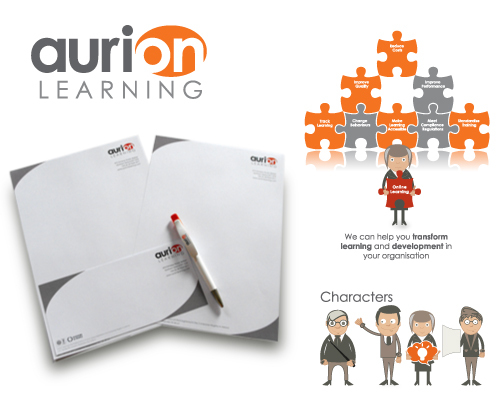 So to start the whole rebranding process, we listened to what the success of the existing Aurion Learning brand was telling us and used this as a basis to build on. The existing brand told us that our customers associated Aurion Learning with reliability, professionalism and creativity. We needed to retain this aspect of the brand to appeal to our existing market but also think about what we wanted the new company branding to say to new customers. How do you want to appeal to new customers? 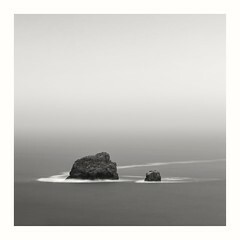 We looked at our current service offering and thought about how to reflect this visually. 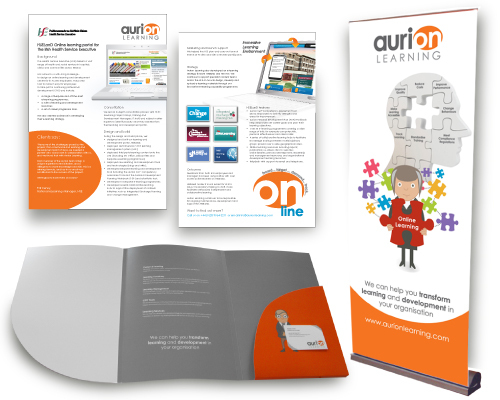 This posed a challenge because the Aurion Learning service offering is varied – we offer different things for different clients, depending on their learning and development needs. We deal with serious learning content and technology that need a careful hand and serious tone and at the same time we must have the creative ability to take e-learning material and breathe life into it. Visually we decided to build on the existing brand giving it a new twist by retaining the clean typography of the existing logo but transforming an element of it into a more visual or “logoized” version. The concept behind this is the idea transforming the “on” part of the Aurion Learning logo from simple typography to a button highlight the fact that Aurion Learning is always “on” always ready to support and deliver to its clients. 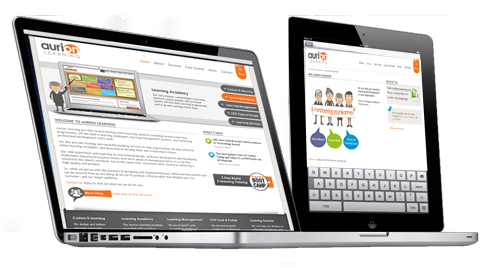 We also integrated the idea of transformation into an accompanying strapline for the website and promotional materials- “transforming learning and development in your organisation”. We are a confident organisation and wanted to reflect this in the branding, so the logo sits on white with no decoration or fuss because it doesn’t need it. The colour palettes are limited but bold. The primary palette consists of two colours, grey and orange. Grey reflects the professional ism, stability and calm side of the company and orange reflects the energy and vibrancy and warmth of its staff. We incorporated the curve of the button into the stationery and online materials. We also wanted to showcase our creative talents by introducing a series of characters that guide you around the website and reflect our service offering. There is a trainer, an instructional designer a designer/ developer and a marketing consultant. We rolled this design ethos over the whole brand incorporating it into the website, blog, internal systems and corporate stationery. We think it is a success.